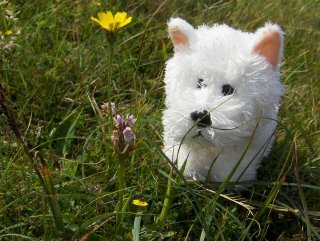 If you look closely you will see this pup is posing with a tiny little perfect wild field orchid! And a dandelion thing. There used to be a great blog out there called Woolywarbler, where Tracy used to show us all her beautiful colourwork and keep us up to date with the adventures of her doggie Disney. Alas, that blog is no more, and sorely missed, but at least I can show the adventures of our own Disney lookalike, who is called -Disney of course! My gosh, what a little sweetie Disney is! Thank you for sharing these most amazing pics from your trip - this island looks so fantastic, I'd love to go there one day and see it myself! Great to hear that you had such a wonderful time there! Yeah, I used to love that blog too!